Ive been to studio 301 in cologne mixing a song with jerry cant tell you much at the moment about it..but this is great!next month i go back to start mixing some of my album,so i am doing it..im not in the pub all the time..though i do take my laptop to the pub and do both things at once sometimes. After cologne we went to berlin and met up with Gary Nuttall,it was great to see Gaz and had a very good time laughing from start to finish!back home now a new BFA home video on the way but i dont think it will be as funny as the last one! Its a new song called 'Kissing Tree' its another acoustic performance done at Torcheys place.. once again i edited all the funny bits and put them together..i think its funny any way...if you dont like drinking then the out takes vid is not for you! We have some BFA albums left thats if anyone would like to contribute to our wine fund and see more of us.. I just got some news from Neil yesterday that he would like me to share with you all. Neil just got back from Cologne recording at studio 301 mixing some tracks for his album with producer/mixer Ulli Pallemans..He was there for 3 days....it was very intense but he did get the results..it sounds amazing. He's not sure about doing a video now...as this will cost too much money. He just want you to know the albums gathering a little more pace than it has in the past 2 years..."a bit faster than a stop i suppose! !haha" he said about it. He's thinking that he will start something in europe first as it feels more comfortable to do it there..and he's getting more excited about the album now. He's also thinking of changing the album title. Would be nice if some of you could visit the forum too and post some things. And let me know if you're missing a anything. Ok...Thanks for the link...I'm going to visit the web site!! Sorry ive not been here for sometime...had to take my overdue library books back!i hope to be back when there is more going on..ive made a concerted effort to finish album... not kidding this time..ive found my way with it now...should be out sometime in the spring next year...thanx for everybodys support...dont forget me...i will be back. Well i wanted to bring you big news... but i thought i'd broke my biggest habit... bitting my nails... it lasted for 2 weeks.. had a few drinks then bit em all off again!! back to square one!! Two years and counting on my album.. gonna have to put it on hold as i start work again soon.. hope to be coming to a city near you.. as long as it has a japanese restaurant i will be happy. Jerry will be dusting off his orange shoes.. well thats if he could find them... between you and me i think they were confiscated.. they made a lot of ppl feel sick. Also jerry and i have been writing with Lisa Marie Presley it went really well, hope to be doing more soon. First of all a fantastic rocking 2010!! I want to thank all of you for all the support in the past year and hope you will keep it up for 2010 as well. Lets hope we will hear and see a lot of Neil this year........and will 2010 be the year that Neil's album will be out???? Let's hope so! I hope you will find it an improvement..if not please let me know! -You must have made the photo yourself! -And it must be taken during one of the promo's in 2009. -There's no limit in the amount of photo's you can send in. -Please add the date and place it was taken, which show it was and your full name and emaildres. 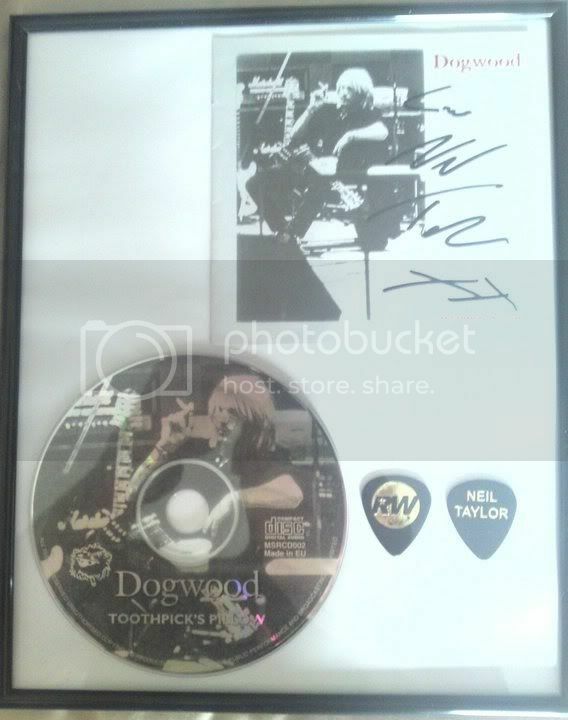 -send your photo or photo's to: neiltaylorfanclub@hotmail.com and add the word photocontest in the subjectline. -People who send me already photo's are automaticaly entering the contest. -If you send in photo's you automaticaly give acces to place them on the fansite. Then this is also the month of Neil's birthday...on the 26th. I will make a slide where everybody can enter their own birthday message again...i will get back to you on that. I also asked him about his album....he wants to put it out probably as a mini album (with only the new songs) The older ones will then be available as downloads only. Neil said he maybe want to use the best latest pictures made by fans which are sent to the fansite for his album sleeve. If you want to have your photos be used for that i want to ask you to sent me the original photo's in a large format without credits on it. On the fansite the photo's will stay as they are with credits on it. Neil said if anyone has any questions for him....please ask him. For that i have opened a special thread at the forum where you can ask your questions for the next week or so....when i have enough questions i will sent them to Neil so he can answer them all at once. I also made a special birthday thread at the forum where you can place your birthday wishes and photo's for Neil's 49th birthday at january 26. Now exclusively streaming on the fansite a new song called For another Day. Neil made this song especially for his loyal fans to let us know he's still here. You can hear Neil's girlfriend Sachi singing on it too. It's not going to be on the new album. Listen to the song on the memberspage HERE. You have to be a member and logged in to hear it. I hope you enjoy it and let us know what you think of the song. You all had the opportunaty to post your questions for Neil at the forum. A nice bunch of questions was the result. I sent the questions to him yesterday and already he answered them for you all to read. Here you can read all about it and more news as well. The voting poll for best photo is going really well...thanks to all that have casted their vote. 138 votes already and counting...If you haven't voted yet...you can still cast your vote untill this thursday january 28. HERE you can se the nominated photo's and cast your vote. Don't forget to sign in as member before casting your vote otherwise it won't count. Neil want me to thanks all of you that has sent birthday greetings to him..He said: That is sooo nice of everybody..hope to see you all very soon.. I'm very happy to announce that i already got some pics sent through from his birthday today for you all to see...You can see Johnny bringing him a birthday carrot cake at 7.45 in the morning...Neil reading his birthdaycards and having his favourite lunch.....lots of meat...lol. You can see all the photo's in photoalbum home/family on the fansite. Go HERE to see all the photo's. The contest for the best 2009 promo photo has ended. 144 votes were cast! a great result! Thanks to all of you that had made the time and effort to vote. Photo number 4 has won the contest with 36% of all the votes. Congratulations! The prizes will be send to the winner a.s.a.p. Look HERE to see the end result of the poll and the photo's again. Neil just informed me about a project he's working on with Jerry Meehan (bassplayer with Robbie Williams) and Dan Farrant (drummer with the Buzzcocks). SEXPUNKDISCO is a rock/electro/retro outfit and they're mixing some tracks at the moment. Are you looking for a nice place to stay during your holidays in the south of spain?? During the 2003 tour with robbie he bought this beautiful villa with private swimming pool to spent his holidays with his family. The times he isn't there it's for rent. Go look at: Villacolina if you're interested. Here some pics of Neil on vacation in Spain. Helloooo there its been the longest time i know but ive been very busy of late with the Robbie Williams promotional tour, what a great time we had i loved every minute,it all finishes on the 19th with a show for Heart Radio somewhere in London ....dont ask cause i dont know where it is either..that will be it until the autumn..but some other good news been working on the SEXPUNKDISCO album thats coming along great,its me..Jerry Meehan[RW] and Dan Farrant [The Buzzcocks]Dan is a drummer but he's also a great frontman/singer its a powerfull rock retro electro outfit..will let you know when its done. Im gonna release my own album around june time, almost finished, i need to mix 6 more tracks..its only taken 3 years thats nearly as long as a Tears For Fears album! !i will be releasing it myself i think but im very happy with it..please if you're intersted in getting a copy please register on this website for news...its a contemporary album..rock/pop a bit T.Rex..[my fav band apart from Staus Quo. We did a show in Cologne with Rob at the limelight last week what a great night..thanx for everyone that came and said hello to me and Jerry in the bar...we didnt drink much before the show honest. I know i need to update this website, that will come when i release my new album i promise. Now that the promo activities for Robbie Williams latest album "Reality killed the video star" has ended for a while it's been quiet here at http://www.neiltaylorfanclub.com as well. But that doesn't mean Neil was just sitting at home doing nothing. I know Neil also works for various other artists as well when he's not busy with Robbie, so I thought it was time to ask Neil about what he's up to now and keep you all informed. When Neil is finished recording for Steve Balsamo he will get around to finishing his own album..He saId that he's stuck on the last couple of tracks but is looking forward to doing it soon as he get some free time on his hands. As soon as he's finished his album he will let us know. In the meantime i will be updating the song of the week, every week to let you enjoy the songs Neil made so far (Dogwood, Bullets For Angels, music from 2006 and new songs) Ofcourse you can also listen to all those songs on the fansite as well. Take care and keep rocking! As you all now Neil is busy finishing his album and is now working on his album booklet. some of you already sent me some nice ones from the last promotour he did with Robbie....but he would like to have more....doesn't matter where or when it is taken. So dig in your photo archives now and see if you have ever made any nice photo's of Neil he can use. Neil will pick the best ones for his album himself and IF he chooses YOUR photo your name will be mentioned at the album booklet as well! -The photo's have to made by you or by someone who gave permission to use them for any of Neil's and the fanclub publicity purposes. In short: the photo's need to be free of any copyright. -There mustn't be any nametaggs, or watermarks on the photo's. -By sending the photo's you automaticaly give permission that your photo's can be used by Neil and his fanclub for his booklet or any other of his publicity purposes without claiming copyright. -You can send in as many photo's as you like. If you know when or where the photo is taken..please add that info as well. Add your (nick)name in the email if you want to mentioned on the booklet if your photo is choosen. 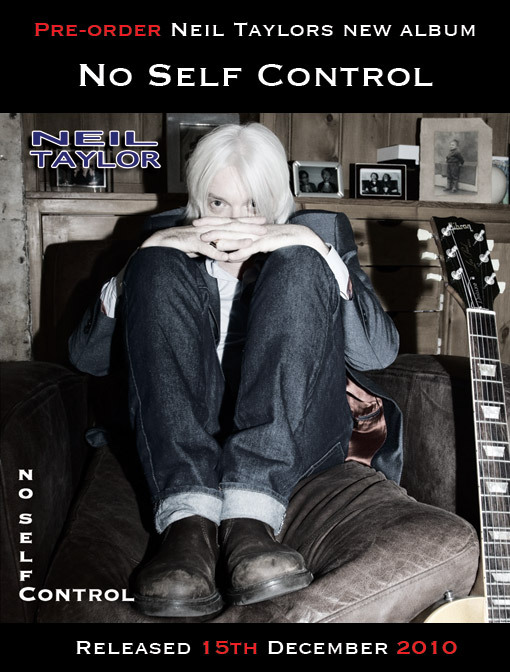 Here’s a short update about Neil’s album “No Self Control”…..He working on finishing the last song. I know you’re all very curious…like me and we’ve been waiting for a long time for this album…but we have to be just a bit more patient. I asked Neil if he had a favorite song. He said that at the moment it’s Cocaine Blues. From next week i will be on holiday for 3 weeks…and won’t be able to put any new songs of the week up. So therefore i will put the 3 songs (Don’t Drive My Car, Dreammachine, and the demoversion of No Self Control) of the new album up for that period. Time just flys by..another few months gone..im in Spain with the family its amazing here..great views,nice big pool,on last track of album 'NO SELF CONTROL" October seems a good month to release it,it will be available from this site..im just thinking it would be funny to read through all my blogs to see how many times i said the album was nearly finished! !i want to promote over the next year as much as i can..Thanx to everyone that has emailed me with their support,it has helped me to carry on with it 3 and 5 months later! Neil has kindly donated one of the last Dogwood cd's (not for sale anymore) to be auctioned for the Donna Louise Children's Hospice . The auction will take place during a big Robbie Williams fanmeeting in Stoke on Trent friday 13th of august. If you don't attend the fanmeeting but would like to bid on the signed cd you can sent an email with your name and adress to miketribute1@yahoo.co.uk with your bid. Ofcourse you can only have one bid and it will go for auction on the 13th for any higher bids. Notice that shippingcosts will be charged on top of your bid! Good bidding and maybe see you on the 13th of august at the fanmeeting. I'm also curious to know if any other members of this fansite will attend the meeting, if you do please send me a message. Then one last other thing. Neil is on holiday now in spain and would like to know if anyone is interested in renting his beautiful villa with swimming pool for a holiday there.The rates are really not that high. Hi there still buzzing from Help For Heroes show..it was amazing but over in a flash..Rob was great.News about my album NO SELF CONTROL i can say it will be out for definate early december,if i can before i will, all depends on work commitments.I will be updating this site soon it is well overdue.I am really looking forward to promoting my album dont know how yet though! !Thanx for all the emails of support i will try not to let you all down! Something you all can do already is telling your friends and family about Neil and his music...and if they're interested have a look at one of the sites or even join the fansite, facebookpage or myspacesite. You can send out an email, or message at your communitypage to your friends that you're a fan of Neil and his music and invite them to have a view and listen at his music and ask them to help promote him! Thank you for all your support and effort so far. If you like the fansite Neiltaylorfanclub as well you could also help out by making a small donation to the help me to keep the fansite hosted. Any amount is welcome and appreciated. you can find the donationbutton (paypall) at the bottom of the sidebar at any page on the fansite. First of all i forgot to mention that wonderfull show of Concert for Heroes where Neil did his thing with Robbie again. Some great pictures of Neil where taken by Miriam Itot and placed on the site in a separate photoalbum. Also for all of you that didn't see the concert on tv, or want to enjoy it all over again. I placed some youtube video's of the concert on the fansite as well. Further i deleted the proboards forum all the members (23) where notified about it. The reason i deleted it, was because it was hardly used by anyone and i didn't saw any use in keeping it online anymore and spent time on it to keep it updated. BUT....to give you still a chance to talk to other fans i made a small board directly linked to the fansite. This means all of you that are already a member of the fansite can login with thir same login info as the website. It has only a few topics is very simple to use and its up to you if you want to use it or not. Other community options on the site are ofcourse the possibility of placing comments, the ilikesbuttons for facebookusers and the general share buttons at blogs, video's and photo's and ofcourse signing the guestbook. Not to forget the Meebo IM chat bar at the bottom of the page where you can connect to all your communitysites at once while browsing the fansite. For any of you who have an Ilike account Neil also has his own artistpage on ilike. This page is directly linked to his facebookfanpage so facebookusers may have already seen it. If you want to have a look at his Ilike page go HERE. Neils birthday important messag ---we need your help! January 26 2011 is going to be a special date because its Neils 50th birthday!! I thought to do something special for him on behalf of all his fans. I already asked you all before if you had any ideas and one person came up with a brilliant plan. Thanks Lynn! Lynn and i talked it through how to realise it and finalised the plan so we can now share it with you. I also contacted Neils girlfriend Sachi about to have her opinion about it and she also thought it was a good plan and Neil would like it very much. We want to make a timeline of Neils carreer highlighting some important dates and add the right photo’s to it. We also want to add a lot of small pictures his fans to it. the whole thing will be printed on postersize and framed in a nice quality frame. But we need you help as well!!! Then i also want to ask you for a small contribution...money wise...so i can print it on good paper and buy a descent frame for it. If we all pitch in we can give him a very special gift he can enjoy for years to come The more we get together the better it will look. You can donate any amount you want in the currency you want through the paypall donate button at the bottom of the sidebar on the fansite! If you only want to donate money and dont want to send in your picture, make sure you add your right name at the donation. I will make a list of all the people that have donated and put at the back of the frame.